JOHN SMITH plays a rumbling fingerstyle. Sometimes he uses a slide. Sometimes he plays the guitar on his lap. Sometimes he even detunes mid-song. His guitar work and honey-on-gravel vocals have brought crowds to pin-drop silence and rapturous applause. The acclaimed singer-songwriter and guitar virtuoso makes a welcome return to the Róisín Dubh on Friday,September 15 at 8pm, where he will be showcase his latest album, Headlong. John first made his name on the folk circuit, opening for folk greats John Martyn, Davy Graham, and John Renbourn. 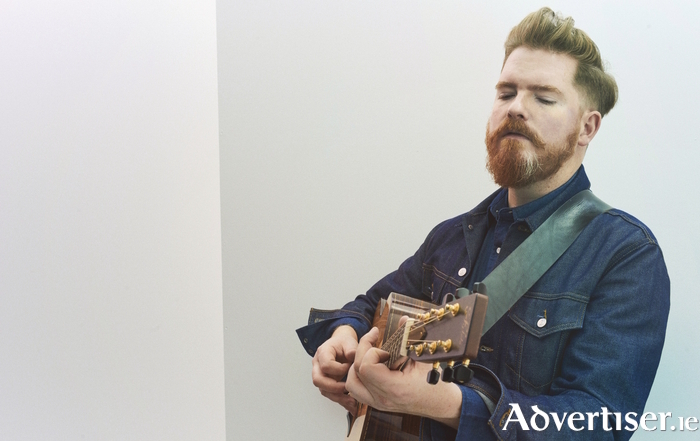 He has guested with artists such as Jackson Browne, Martin Carthy, and Glen Hansard, and played guitar for artists such as David Gray, Lisa Hannigan, Joe Henry, and Joan Baez. As a solo artist, Smith has been lavishly praised for his talents as a songwriter and guitarist, with The Sun hailing him as "a guitar genius"; The Sunday Times describing him as "the guitarists' guitarist"; while Headlong was given a 4-star review by MOJO, which called the album "gorgeous". It is not by chance that Headlong comes bearing a title implying impulsive, breakneck motion - written as it was, during various touring stints in North America - with a view ahead, to new horizons and new songs, to new opportunities, and new audiences. Over an afternoon phone call last week John spoke with me about his music and Headlong. First though, I asked him about the album cover, a black and white photo of Smith’s profiled, bearded face, with eyes upraised. I remark that in the photo he looks like some medieval monk or saint and ask was there any such mystical or spiritual intent in composing the image. “That is a completely unexpected suggestion I have to say,” he replies with a warm laugh. “Then again, having a career in music is a form of self-flagellation,” he quips. Smith recorded Headlong after completing a lengthy tour as a sideman for David Gray. He describes the contrasting impacts of being a session musician and a solo artist. “If you are playing with other people you are in the amazing position of being able to play a lot on the road," he says, "because when you are touring solo the thing you do least is play your songs, because you spend all the time driving, thinking about the next meal, getting to the gig. One such track is the beguiling ‘Joanna’, a love song in which the singer is away from his beloved but knows that their feelings for each other are undiminished and strong. “That song is about my wife, but Joanna isn’t her actual name. She’d be mortified if I used her real name!” Smith notes wryly.